Delicious DTLA: Delis, Diners & Dips! 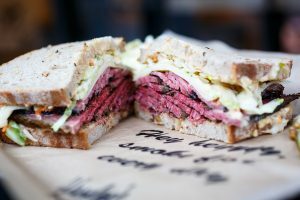 Do you ever get the urge to dive into a big juicy sandwich, stacked a mile high and dripping with gastronomic goodness? How about whiling away a lazy Saturday morning over blueberry pancakes and a fresh brewed cup o’ joe? Or do you prefer your meal with a side of noir? 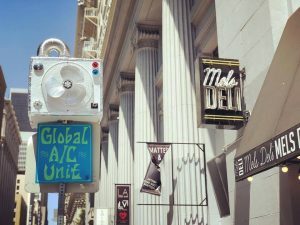 DTLA is the ultimate destination for vintage diners, authentic delis, Prohibition-era eateries, and legendary French Dip spots–some even have a shady past! 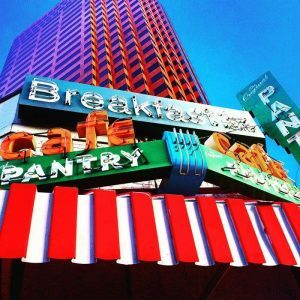 Delicious DTLA has many fascinating stories to reveal, told through the language of great food! Cole’s, Originator of the French Dip Sandwich, opened in 1908 in the Pacific Electric building. Evoking the spirit of an early 20th century saloon, the welcoming 40-foot Red Car Bar boasts original glass lighting, penny tile floors, and historic photos, preserved in the restoration of the cherished landmark. During Prohibition, Cole’s was a favorite hangout for gangsters like Mickey Cohen (If you were a regular customer, your “coffee” came with a little something extra!). 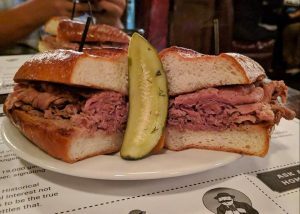 Today, continuing the tradition of the Golden Age of American cocktails, the Red Car Bar’s ample selection of premium spirits, drafts, and historic cocktails compliment the saloon’s classic French Dip sandwiches, appetizers, salads and sides. 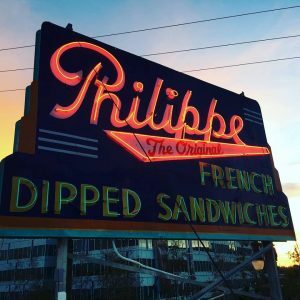 Philippe The Original is one of the oldest and best known restaurants in Southern California, established in 1908 by Philippe Mathieu, who claimed the distinction of having created the “French Dipped Sandwich.” One day in 1918, while making a sandwich, Mathieu inadvertently dropped the sliced french roll into the roasting pan filled with juice still hot from the oven. The patron, a policeman, said he would take the sandwich anyway and returned the next day with some friends asking for more dipped sandwiches. And so was born the “French Dipped Sandwich,” so called either because of Mathieu’s French heritage, the French roll the sandwich is made on, or because the officer’s name was French. The answer is lost to history. Featured on Diners, Drive-In’s and Dives, the Cooking Channel and Jonathan Gold’s 101 List, this cozy vintage-style diner serves updated versions of old-school comfort fare, such as maple-glaze bacon doughnut, baked eggs, steak sandwich, and catfish, plus creative desserts. Located on a historic stretch of Main Street between Fifth and Sixth streets, the restaurant occupies the site of a long-forgotten diner, with the original hand-painted wall menus still intact. High ceilings, vintage wallpaper, wooden tables, scuffed tile floors, cushy red leather booths and an old-school, lunch counter-style open kitchen evoke a picture-perfect model of a pre-WWII-era diner. Nick’s Cafe started back in 1948 by Nick, his Navy buddy, and Lois the server. Nick was just out of Navy and decided to open a little diner across from the River Station freight yards. Known for serving bone-in ham at the horseshoe counter, customers started calling the little cafe the “Ham House.” After a successful run, Nick sold his diner to a couple of LAPD detectives who put in a train that ran around the ceiling. After many good years, the place fell into dark times–the old rail yards were grown over and the freight buildings were empty. Flash forward to 2009, when the current owner took over. Over 60 years later, Nck’s is still known for the ham, the smiles, and the coffee. Wexler’s Deli stands for three things: tradition, craftsmanship, and quality. Born of a desire to serve classic Jewish deli food made by people who care, Wexler’s uses old-school methods to handcraft their pastrami and smoked salmon. After curing in a special blend of salt and spices, the meats and fish are slowly smoked in-house over apple wood and sliced by hand in front of your eyes. Wexler’s also serves breakfast sandwiches (Cheezy Eggs, Bagel with Lox) and a selection of sides including coleslaw, potato salad, egg salad and tuna salad. Wash it all down with a good old fashioned Chocolate Phosphate or Chocolate Egg Cream. This unassuming, counter-service standby is known for its hearty, deli-style sandwiches with an Italian flare. Indulge yourself with the spicy Mel’s Melt (Russak Roast Beef, Habanero, Jack Cheese, Horseradish, Pepper Spread, Dill Pickle). Or settle into the generous Mel’s Italian (Genoa Salami, Mortadella, Capicola, Jamon, Soppressata, Provolone, Homemade Mustard). Other zesty choices include Prosciutto & Burrata (Prosciutto di Parma, Burrata, Arugula Dressed, Olive Oil, Balsamic Vinegar); Caprese (House Made Pesto, Fresh Mozzarella, Tomatoes, Balsamic Vinegar), and Muffaletta (Genoa Salami, Mortadella, Provolone, Olive Tapenade, Mayo, Lettuce, Tomato, Onion). Delivery is available through these apps: Postmates, DoorDash, Caviar, Grubhub, Eat24, and ForkSpot.